Today is National Sibling Day, and a chance for bereaved siblings to tell their stories about the loss of their brother or sister. 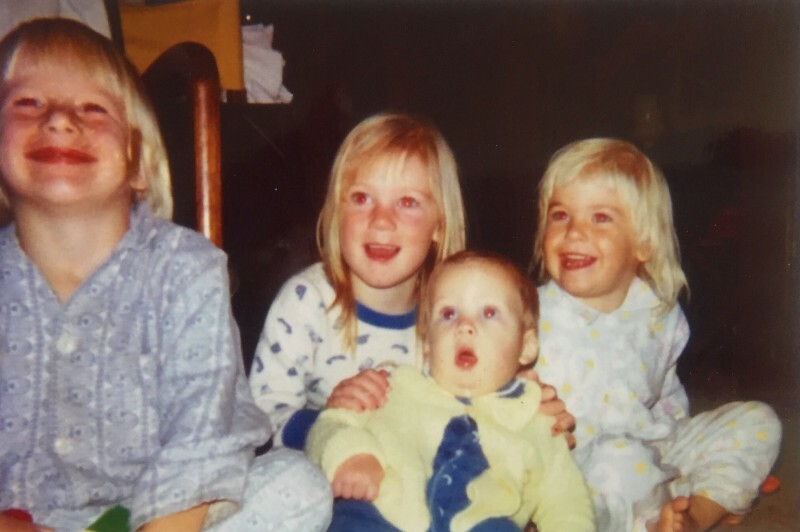 Red Nose staff member Lacey shares her story of the tragic death of her brother Glenn to SIDS in 1977 and provides her advice for other siblings who are grieving. ** A warning that some readers may find the following content distressing. To lose a sibling is an awful experience. Glenn’s death is my earliest childhood memory – my saddest, but also my most cherished memory. My older sister, Anita and I shared a bedroom with Glenn and on June 10 1977, I woke up early and was feeling scared, so I went into Mum and Dad’s room for cuddles. Somehow, my Mum knew something was wrong. She went and checked on Glenn and then shrill screams followed. Being so young, all I remember is being scared, confused and frightened – I couldn’t go to sleep for many years afterwards without a light on. I clearly remember us all saying goodbye to Glenn at the back of the ambulance. We each gave him a kiss and a cuddle and bid him farewell. I also remember being allowed treats – sugar on our rice bubbles! And all the visitors who were kind to us. Sadly, this tragic event supersedes all of the memories I have of Glenn when he was alive. I only remember his death - I do not remember him alive. My advice for other people who are grieving a sibling is to continue to talk about your brother or sister. Say their name and cherish your memories. I will quickly take in my surroundings and judge – is this person ok to hear that I am one of five kids but that my baby brother died? As I am getting older and possibly, because I work at Red Nose, I’m more comfortable saying that I am one of five kids. This also gives me an opportunity to talk about my baby brother Glenn, something that our parents always encouraged us to do. Also remember that if you need them, the wonderful counsellors at Red Nose are available to talk to you 24/7, free of charge. Glenn’s death transformed our family’s life. Our Mum went from being a stay at home mum to running a charity from our home – and being awarded an Order of Australia award for her work to establish SIDS and Kids and fund research and public health campaigns to reduce sudden death in infancy. (Lacey is the daughter of Kaarene and Kevin Fitzgerald, the founders of SIDS and Kids Victoria). We all are extremely proud of our Mum and honoured to have been involved in many aspects of her work, having the privilege of meeting many wonderful and generous people along the way. It is quite humbling to think Red Nose has grown from its genuine grass root beginnings – literally operating from our living room – then expanding to SIDS and Kids and now Red Nose, Australia’s leading charity for preventing sudden death in infancy, which continues to serve the community in unique and heartfelt ways. My current role at Red Nose is Executive Assistant to the CEO, Keren Ludski, but I’ve had many jobs at Red Nose over its proud history. When my siblings Karl, Anita and Mike and I were little, we would help in the office during school holidays and at home with mail outs, folding letters and sticking address labels on envelopes. We volunteered at fundraising events such as the Paper Aeroplane Championship and Red Nose Day. In the 1990s, I assisted on the reception desk during the busy Red Nose Day months, answering the phones and helping where needed. In the 2000s, I waitressed at fundraising events, modelled for Red Nose Day advertisements, helped sell auction prizes at the many Balls, and helped sort raffle tickets. I cherish these times volunteering and working with my siblings and my Mum, as it helped us to feel connected as a family and to our brother Glenn. I feel privileged to be involved with the organisation that grew from the tragic event of my brother’s death and continues my parents’ vision of finding answers to why babies die suddenly and unexpectedly, counselling bereaved families through their worst days, and educating families on safe sleeping and safe pregnancy. Red Nose Grief and Loss Helpline is available 24/7. Call us on 1300 308 307 or visit our website for more resources.